Sharing Circle offers a supportive place to share and learn empowering tools to improve communication skills and personal growth. S.P.E.A.K. Sharing Personal Experience and Knowledge is how we grow and support one another on our journeys. Fall sessions begin Tuesday, September 11th and run through December 11th. These are the 2nd & 4th Tuesdays of the month, at 4:30pm-5:30pm Free of charge, come as often as you like. We will explore the brain's potential to rewire itself through consciously journaling gratitudes and other positives we choose to focus on day to day--for 21 days. Get ready to empower your life and turn self-doubt into self-care. An online FB community where we learn and share empowering tools. Free sharing circle on Facetime covers seven Saturdays beginning with Oct 6th from 11:30-12:30 EDT. Intimate private group facilitates up to 5 attendees. 3) Join us on the first date and see if it's what you're wanting. 4) Return as often as you like, but give us a heads up if not continuing. Water the seeds of change from within and create a life you love. This self-care workshop offers an opportunity to explore positive STEPS TO CHANGE SELF-DOUBT INTO SELF-CARE AND LIVE A BALANCED LIFE. If you are unsure whether this workshop is for you, I invite you to complete the "Self-Esteem Test" below, to help gain insight into your current self view. 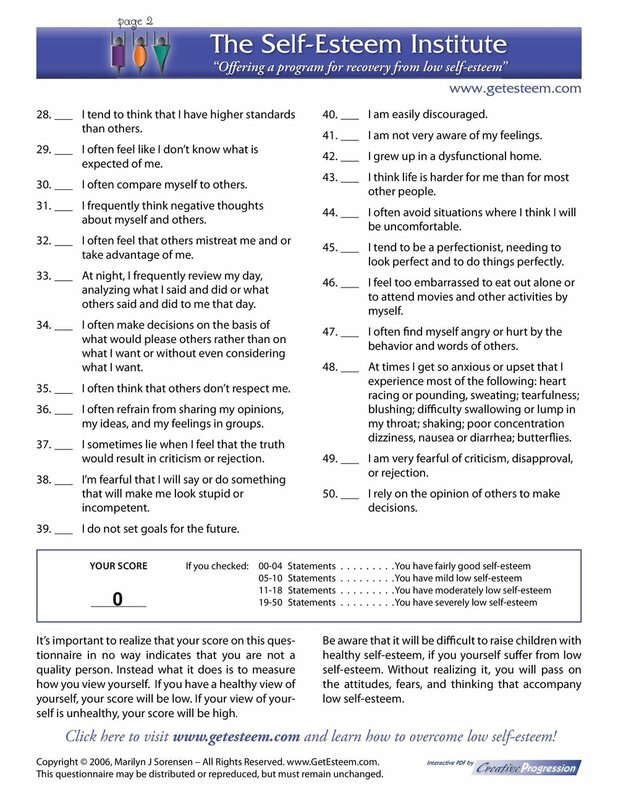 Note that it is important to realize your score in no way indicates that you are not a quality person. Instead it measures how you see yourself. A lower score indicates a healthier view. The guidance written on both pages of the test will clarify the details. Please take an overview before you begin. I will then forward an agenda and details needed to participate. I am so certain that this event will benefit you that I guarantee your satisfaction, or your money back for the program fee $50. Join Like-minded souls to water the seeds of self-care and become your greatest version! This test is private / for your use only. Discover tools to build a life you don't have to escape from! Take time out with like-minded souls to discover how we turn self-doubt into self-care. Through workshops and interactive experience we are called to find and express a more authentic version of ourselves. Build a life you won’t want to escape from. Mindfulness creates a peaceful refuge for ourselves and others. Join us to explore how breathing mindfully during simple movements can restore peace and balance to your life. This new series is based largely on the 10 Mindful Movements created by Vietnamese Buddhist monk, Thich Nhat Hanh. Contact me for more information on this and other wellness workshops, as well as private Coaching done in person or by phone.